CONS: No complaints at this price! Aimed at aspiring superstar DJs, bedroom mixers and club jockeys, Numark's entry level CD Mix 1 combo is a convenient package offering dual CD transports and a basic mixer. The all-in-one unit is a breeze to operate, with its no-nonsense controls making it easy to professionally mix tracks, with additional features onboard for the more adventurous. The wedge shaped unit houses two matching CD players, each offering the basic cue, track skip, play/pause controls, with advanced features letting wannabe Fatboy Slims fiddle about with the pitch, search backwards and forwards through songs at variable speeds and program a sequence of tracks. A large pair of LCD screens above each of the CD's controls offers useful information on the modes selected and time remaining/elapsed for the playing track. Mentalist DJs wishing to bring da house down with a banging set of beatmatched tunes can avail themselves of the BPM display feature which, combined with the pitch feature, should help avoid the embarrassment of a 'train wreck' mix. This is when a new track is faded in slightly out of synch with the previous one. The resultant unholy cacophony of mismatched beats is often likened to the sound of a herd of wildebeest rampaging across the dance floor. Not cool. Although it has to be said that the beatmatching facilities on the CD Mix-1 are unlikely to thrill 'ardcore drum'n'bass heads looking to mash it up bigstyle, it's certainly a good place to start on. For controlling output, the Numark comes with four sliders for adjusting microphone levels (for making those all-important dedications), channels one and two and a master output control. A row of three tone controls lets you tweak the EQ levels with a matched row of coloured LEDs indicating output levels. Both mix channels have a toggle switch for selecting CD or turntable input with a switchable cue channel for preparing the next tune - DJs will appreciate the provision of both 1/8" and 1/4" output sockets for headphones. In use, we found the CD Mix1 to be an exemplary performer - the CD controls were responsive with no discernable lag and the sound quality was impressive for an entry unit. The CD decks managed to play any CD we threw at it (including CD-Rs), with a handy CD auto- fader start feature making basic mixing a piece of cake - even for drunken wedding DJs. Hooking up some turntables and blasting some vinyl through the Numark revealed some decent quality phono pre-amplifiers onboard - our old 45s sounded great! 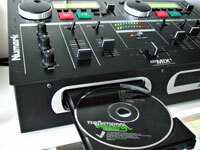 With a street price around £240, the Numark CD Mix 1 represents remarkable value for money and, to be honest, a whole load of fun. Hook it up to your home system, your hi-fi or zillion watt soundsystem and you're off! NOTE: we would like to review other Numark products but their PR department - when they finally bothered to reply - weren't interested. 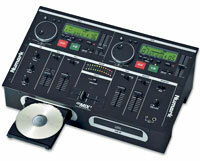 So this is your lot when it comes to Numark.